Wednesday October 12th – Lodge 43’s Stated Meeting. Topic: MOVPER, Ubar providing refreshments. 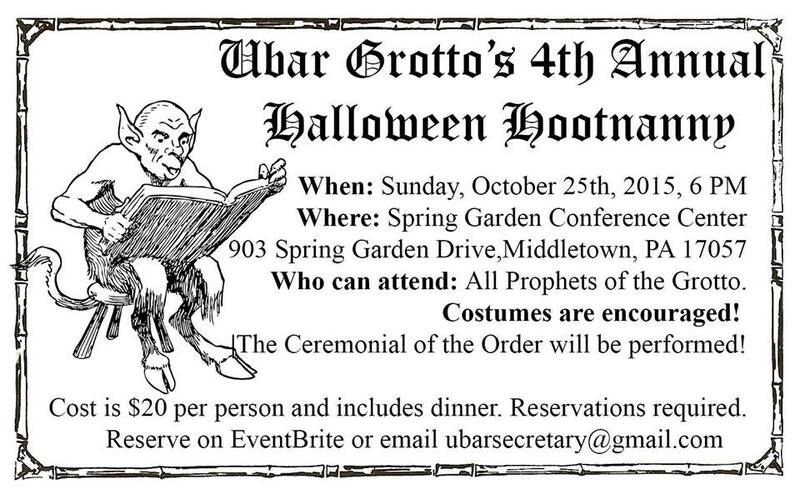 Sunday October 23rd – Ubar Halloween Hootenany, Meeting, and Dinner. Officer nominations. Hey, I have a great idea. Let’s go to New Orleans in late July! Ok, under normal circumstances you’d say “Are you out of your mind? It’s like Eleventy-Billion degrees there that time of year” and well… you’d be right. A delegation of Ubar Prophets were definitely out of their minds and went to New Orleans for the Supreme Council Session. Representing Ubar was Monarch Pete Ruggieri, Secretary Baby Sheik Jay “Laser”, and Fez-misplacer George Hindson PM. Once we got to New Orleans we met up with our friends from all over the Enchanted Realm. Lots of great fellowship during the week as we interacted with Prophets from all over North America. New Orleans is an amazing place with great food, live music and tons of history and we took in as much as we could in a week. The biggest news to come out of Supreme Council was the election of our friend Victor Mann of Azim Grotto to the position of Grand Captain of the Guard. That means that Victor is now 7 heartbeats away from being the boss of all of the Grottoes of North America. Ok, or 8 years away the slow way. Next year’s Supreme Session is in Beautiful Toledo Ohio. Start planning now! It’s been a busy year in the Enchanted Realm in 2016 and we’re not letting off the gas. In June a number of Prophets got together at Prophet David Steffie’s farm for some outdoor Grottoing. We had a great meal, great fellowship and lots of firearms. A big thank you to David Steffie for hosting and Prophet Dave Goss for bringing many fun toys for us to play with. Pro. Chad McComsey has taken the helm of the Award Winning newsletter, The Pillar. I present you with the January edition. – Pro. Pete Ruggieri, Potent Monarch. Saturday 12/12/15 at Tellus360, 24 E King St., Lancaster PA. 2pm-4pm. Dress, Christmas/Holiday Festive. Prophets! Join us at Tellus 360 tomorrow for the installation of officers. There is a brief open ceremony followed by libations, lies, and good times. At 4pm stay for the Lancaster Santa Stumble and see 1000 drunken Santas, Mrs. Clauses, Buddy The Elves, and Cousin Eddie’s walking around the Square. Our past Monarch and soon to be Past Secretary, Seth Anthony will also be getting installed as Worshipful Master of Treichler Lodge the same evening. So if crowds of rowdy Santas are not your thing, support Prophet Seth as he takes the East. March 22nd, 2014 marked a great start to the membership year for Ubar. On it’s first Ceremonial of 3 this year, half of our membership goal was attained! Marking a feat just as impressive, over 50 non-neophytes joined in the fellowship that evening — no easy task for Sunday night. Before the meeting, Prophet Spooner decided to bribe the delegation with $5 cigars. The bribe was successful, as all heckling was directed at Prophet Il Duche. Prophet (and soon to be Fryar) Richards provided a tobacco locker to be auctioned for charity that Prophet Loughin couldn’t figure out how to operate. All told, the Grotto collected $286 for children to receive dental work. Awesome job prophets! Our Pants-fearing Monarch then called the meeting to order. Discussed was the possibility of a “floating” meeting, one where the Grotto could meet closer to a group of Prophets that could not always make the meetings due to the long drive. The Prophet that made this suggestion did not provide a location, and he was heckled mercilessly. After another long-winded report from the Fund Raising chair (who promoted that guy? ), along with much shorter reports from the Sheiks, Prophet Tim “The Tyrant” Settlemeyer, PM, donated the flag of the Whiskey Rebellion to the Grotto, which we shall fly with pride. After the meeting, 11 new prophets were brought into the Realm. As a final treat before he leaves on his Friary Journey, Prophet Richards provided one last performance as His Majesty. We shall miss him dearly. As the Ceremonial drew to a close, Prophet Anthony, PM, promptly kicked everyone out, the fuddy-duddy that he is. Our next meeting is on April 26th. We hope to see all of you there!